WEST WINDSOR – Two Mercer County Community College (MCCC) honors students found their way to Princeton University over the summer, with an opportunity to participate in cutting-edge research as part of a nine-week internship program. Cathryn Jolley and Michael Vetick, both 2015 MCCC graduates with dual concentrations in Biology and Chemistry, returned to Mercer Oct. 7 to provide briefings on the research they participated in over the summer. Both agreed the opportunity to work on major, active research projects had a profound impact on their views related to scientific research. 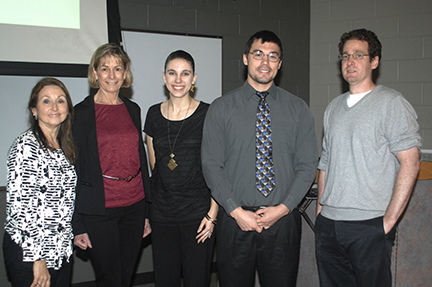 Recent Mercer graduates Cathryn Jolley and Michael Vetick (second and thrid from left) returned to MCCC recently to give presentations on their honors research projects at Princeton University. Also pictured are MCCC Biology Professor Diane Hilker, Chemistry Professor Helen Tanzini, and Dr. David MacMillian of Princeton University, who supervised Jolley's research. Jolley’s presentation, “Synthetic Efforts Towards the Synthesis of the Natural Product Idiospermuline,” outlined her work toward the creation of a substance found naturally in the seeds of a rare tree in Australia. The product has proven useful in inhibiting nerve activity in certain parts of the human autonomic nervous system. The research has direct application to the creation of new pharmaceuticals, she said, particularly those targeting certain diseases causing areas of the nervous system to overreact. Jolley, who will be attending Rider University in the spring to pursue degrees in Secondary Education and Biology, encouraged students in the audience to make the most of their Mercer education and seek out every available opportunity. Vetick’s research project, “Transposon Mutant Screen of E. coli with Nitric Oxide Treatments,” focused on identifying genes in bacteria that make them resistant to the human body’s natural immune system. Successfully identifying and neutralizing those genes, he said, could give doctors an option in treating a variety of illnesses. Vetick, currently a Molecular Biology and Biochemistry major at Rutgers University, also credits Mercer with advancing his academic career. “If you are going to Mercer, you are going to a great place,” he said. MCCC Vice President of Academic Affairs Dr. Eun-Woo Chang, a former Chemistry professor, said participation in an honors research program virtually guaranteed acceptance into a four-year university. He also noted that new opportunities have been created at Mercer, thanks to two recent National Science Foundation grants for scholarships and other support for science, technology, engineering, and math (STEM) students. The Honors Research Program is coordinated through MCCC biology and chemistry faculty members. To participate, students must have at least a 3.0 GPA in their science classes, be recommended by an MCCC professor, and devote a minimum of six hours per week at the research institute.